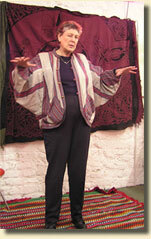 Fionnaghal is a member of the Society for Storytelling. She specialises in tales from Britain and Ireland especially Berkshire, Oxfordshire and other parts of central Southern England. However she will tell stories from any part of the world if required. Some tales are true, some said to be true, the origins of others lost in the mists of time.